It is not uncommon for SAP system copies, including any post-editing, to take several days to complete. Meanwhile, testing, development and training activities come to a standstill, and the large number of manual tasks in the entire process ties up highly skilled SAP BASIS staff. Enterprises are looking to automation as a way to accelerate SAP system copies and free up staff. However, this is only one part of the problem: What further complicates the system copy process is the need to safeguard sensitive data and manage huge data volumes while also ensuring that the data used in non-production systems adequately reflects the data in production systems so the quality of development, testing and training activities is not compromised. 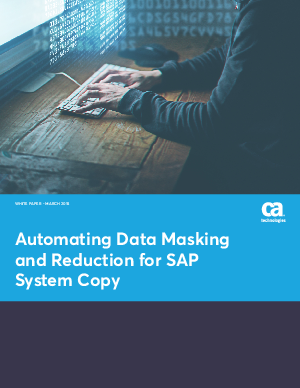 This white paper explains how a considerable portion of the SAP system copy process can be automated using the CA Automic Automated System Copy for SAP solution and SNP T-Bone, helping enterprises become more agile, go faster and free up resources, and achieve a level of visibility and compliance that makes their SAP system copies easy to audit.